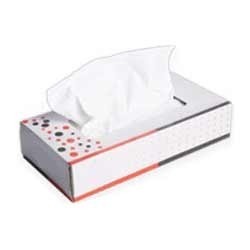 We are an eminent firm engaged in offering quality assured array of Facial Paper Tissues to our valued clients. The provided tissue is well-designed using the qualitative components. Owing to our vast manufacturing facilities, we are able to offer Face Tissue. With the aid of sophisticated machinery and technology, we manufacture our entire range under the strict vigilance of our professionals. Style: Plain / emboze/ apluture subject to availability..
Freshal Face Tissue is soft to use and come under very attractive Packaging satisfying our customers in all aspects. Our face Tissue range varies from single pack to combo Pack of 5 face Tissues. 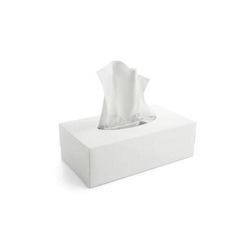 We offer a fine quality face tissues made of good quality soft paper. These find extensive application for household and commercial purpose. Our manufactured face tissue pass several stringent quality control measures to ensure complete hygiene. It does not leave traces of paper on the face after. Extra soft facial tissue that comes in a box serves high brightness with strong absorbent. Let the glow of health and hygiene reflect on your skin with Olivia Facial Tissues. These highly absorbent tissues remove moisture & bacteria by almost 98%. Made of natural fiber, theses tissues are eco-friendly and have passed stringent quality control measures. Facial tissue and paper handkerchief refers to a class of soft, absorbent, disposable papers that is suitable for use on the face. They are disposable alternatives for cloth handkerchiefs. The terms are commonly used to refer to the type of paper tissue, usually sold in boxes. Fresh N Fine Products Pvt. Ltd.